Dinesh Karthik opened up about his competition with Rishabh Pant for the flight to England and also spoke about KKR. 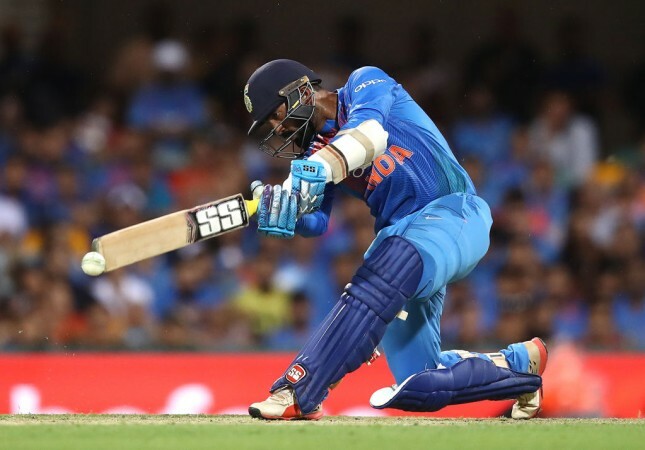 India's 15-member squad for the ICC World Cup 2019 has been announced and a point of contention was the selection of Dinesh Karthik over Rishabh Pant. Talking about the debate, Karthik himself admitted that the young wicketkeeper will have a long career and redefine Indian cricket by taking it to the next level. "I think he's a very special cricketer and he is going to have a long and bright future for India," Karthik told Sports Tak in an interview. "I can see Rishabh and me playing post World Cup for a long time. It's not for me to justify my place but now that I have got an opportunity, I will do the best I can," Karthik added. "I think Rishabh is a very, very good cricketer and that's not for me to say; everybody says that about him. He's got some special skills, the ability to hit a ball that not many people have. And as I said, I genuinely believe that he and I will be playing for India for a long time to come post the World Cup. I think we'll have a great opportunity to play together," said Karthik. Karthik also spoke about Pant's positive attitude and how he is someone who is always relaxed. "I really like the kid, he's got a lot of energy and he's a very positive guy irrespective of whether he has played well or not. He's always relaxed and I enjoyed being around him. He's got good energy, he's somebody who is always smiling and people around him are laughing so I think he's somebody who's going to take Indian cricket to a newer height," added Karthik. On April 15, Karthik was named as a part of India's travelling contingent by BCCI's acting secretary Amitabh Choudhury. Chairman of the selection committee, MSK Prasad, said that Karthik was selected above Pant because of the former's superior wicketkeeping prowess. According to him, Karthik would only play in case MS Dhoni gets injured and in that case, Karthik's wicketkeeping abilities, put him ahead of the 21-year-old Pant. Karthik also opened up about his feelings on the morning of the selection meeting and said that he was quite nervous despite being relaxed on the days leading up to the day. "I was very happy. Being part of the World Cup is a very special occasion," Karthik told in the interview when asked how he felt when he heard his name being included in the World Cup squad. "My family and close friends called me. We spoke and all of us were happy, so I felt quite good." Smiling from ear to ear, Karthik admitted to indulging in the sweet delicacy of 'Roshogolla' as he was in Kolkata during the announcement. Karthik is the skipper of Kolkata Knight Riders and his team is scheduled to take on Virat Kohli's Royal Challengers Bangalore at the Eden Gardens on April 19. The topic of KKR also came around in the interview where the 33-year-old spoke about young Shubman Gill and justified his position in the batting order. "Novelty is nice, new things are always nice and it's great to see a young new player like Shubman doing well but I always believe that experience has a lot of value," Karthik said when asked why the 19-year-old does not bat in the top 4 despite doing well in limited opportunities.